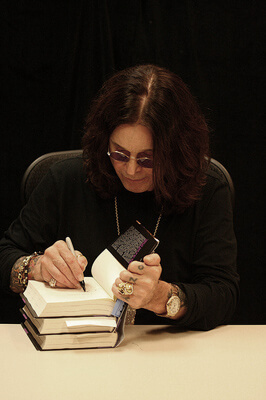 Ozzy Osbourne, signing at the store in February 2010. Warwick's is pleased to continue its long-standing tradition of hosting outstanding author events for our community, most of which are offered on-site and at no cost to our patrons. We encourage you to attend often to experience a treasure trove of diverse authors and books. To make your author event experience at Warwick's a pleasant one, please take a moment to review our signing guidelines. In order to be signed, we ask that the author's latest title be purchased from Warwick's. If you pre-purchase your book, please make sure to bring your sales receipt with you to the event as proof of purchase. Books must be purchased prior to having them signed. Authors will not sign paraphernalia (other than books) unless it is specifically announced at the event that they will do so. It is at the author's discretion whether or not they will sign books for collectors. These same signing guidelines apply to collectors, who will be asked to wait at the end of the signing line. If you have any questions regarding any of the guidelines or any signing concerns, please address them to the Warwick's staff at the event and not to the authors. We all want the authors to have the most pleasant experience possible, and do not wish to place them in an uncomfortable or awkward position. These guidelines have been put in place to ensure that you and our authors have the best possible experience. Thank you for your consideration and for the opportunity to offer you independent books for independent minds! As an independent, family owned business with strong ties to the community, Warwick’s recognizes the importance of supporting local authors and have created a successful ‘Weekends w/Locals’ Program. Events within the Weekends with Locals program include a two hour table signing during store hours, typically on Sunday, with no formal speaking portion. The author should currently reside within San Diego County limits. Your event at Warwick's must be the author's first in San Diego. For consideration, authors must first email the Local Author Coordinator at authors@warwicks.com with information about the book’s content, target audience, publicity or any other information that will help Warwick’s make an informed decision. Please do not submit a copy for review unless requested. Acceptance of review copies does not constitute an agreement to carry the title. Submitted review copies automatically become property of Warwick’s and will not be returned to the author. Any books not selected for the Weekends w/ Locals program will be donated to charity. Titles must be fully bound. No manuscript formats will be reviewed. Submitted titles must be published within the last calendar year. No older titles will be considered. Titles published through CreateSpace, a platform owned by Amazon, will not be considered. Unlike other publishers and distributors, Amazon's wholesale terms and conditions do not meet industry standards. Titles must be available from the distributors of Ingram or Baker & Taylor. Titles must be fully returnable to the above distributors. Discount from the distributors must be standard “Reg”. 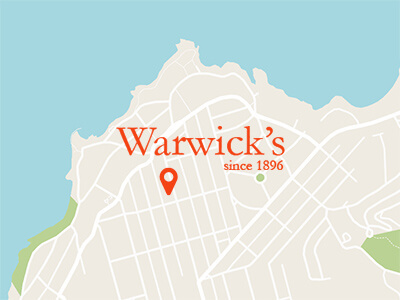 Unless prior arrangements have been made, Warwick’s does not accept titles on consignment.